Instructions: Score a 7" x 11.5" piece of kraft card at 5.75" to create a 7" x 5.75" card base. Select the backing paper from the pad and cut a piece slightly smaller than the base card. Edge with Crumb cake ink and adhere to the card base. Cut a coordinating rectangle (4" x 5.25") from the pad and stamp the sentiment in the centre using black ink, cover with clear embossing powder, remove excess and heat to set. Edge the rectangle with crumb cake ink and adhere to the card base. Die cut the large rectangle in kraft card and die cut the smaller rectangle inside this to make a frame. Stitch around the frame in yellow thread. Die cut 2 Delicate borders in kraft card and cut to the width of the frame. Adhere to the card approximately .25" from the top and the other approx. .25" from the bottom. Add the frame using shaker foam. 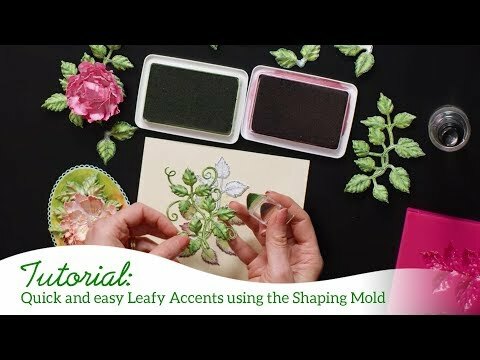 Make the leaves: Stamp onto white card using black ink. Colour using granny apple green and crumb cake inks and die cut. Place face down onto the mold and spritz lightly with water. Place the top of the mold on the leaves and run through the diecutting machine to shape. Make the flowers: Stamp the flowers onto white card using crumb cake ink. Colour using the blueberry bushel, Pumpkin pie and melon mambo inks, shading slightly darker where the pattern on the leaf changes. Diecut and shape by bending the petals up from the centre button and then flipping them back where the pattern changes. Add a shiny button using hot glue. Make the buttons: Stamp the buttons on paper from the pad using black ink and die cut. Cover with 3D crystal lacquer and allow to dry. 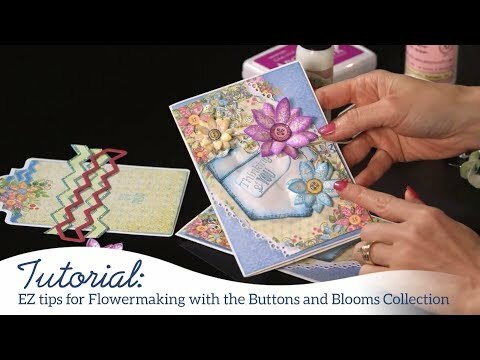 Position the leaves, flowers and buttons onto the card using hot glue.